Are you looking for a new garden room and need a little inspiration? 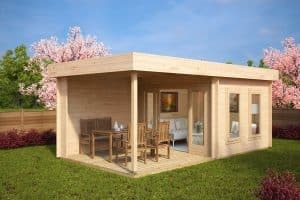 We are happy to share with you our most popular and trendiest garden buildings in the UK, Germany, Austria and Switzerland. Have a look at our 10 bestselling garden rooms during April 2016. The Lucas E Garden Room with large veranda was first introduced at the beginning of April this year. We received an order for the Lucas E cabin the very first day of the launch! This garden room has since become our new bestseller which we believe speaks for itself! Many of our customers call the Hansa Lounge XL a fancy summer house. 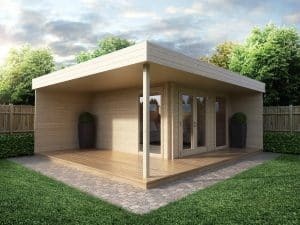 But when we designed the Hansa style garden houses we wanted to create a modern looking and spacious garden room that differs from hundreds of similar garden buildings that you find everywhere. 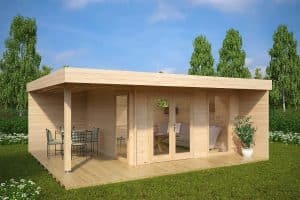 Hansa Line garden buildings offer: more light, better views to your garden and a more contemporary look. Paula became an instant hit ever since it was introduced. 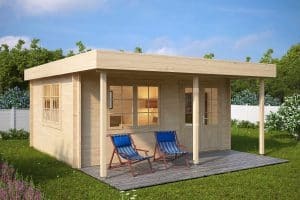 This cabin is the number one choice for owners of small gardens, who are looking for a multipurpose garden building that uses space efficiently. 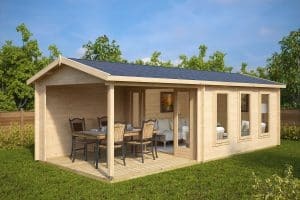 The Paula log cabin has a large storage room, garden room and a veranda for al fresco dining, all in one very affordable garden building. 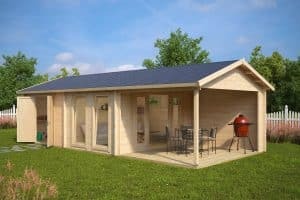 The Ian C garden log cabin is the number one choice for our customers who are looking for a garden billiards room, games room or a large garden office building. 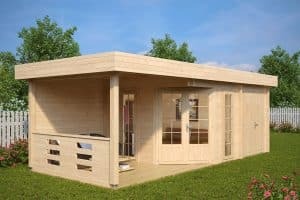 At 20 m2 the Ian C log cabin comes with 50 mm wall thickness, double glazing in windows and doors and 28 mm floor boards as standard kit! 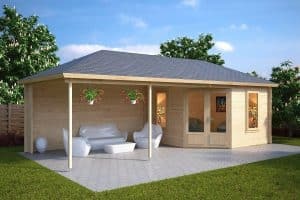 The Hansa Lounge garden log cabin is a good choice for those who are looking for an affordable garden office but don’t want to compromise on quality and style. The Hansa Lounge DIY garden office can be installed within two to three days. Double glazing in windows and doors are included in the standard price. High comfort levels, style as well as impressed clients and business partner visitors to your Hansa Lounge are common effects that the Hansa Lounge garden office may evoke! Eva C is a simple garden summer house with large windows that open up to frame a good view of your garden. 40 mm walls instead of commonly used 28mm make it sturdier and extend its life span compared to other garden buildings that look similar on first sight. 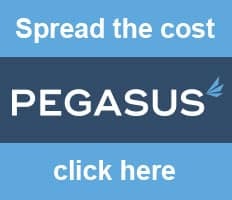 Great value for your money. Sophia is probably our most elegant garden log cabin. This summer house has 12m2 of outdoor recreational space and 10m2 inside. The garden room has double glazing in windows and doors, so by simply doing some extra insulation you can use the room all year round. 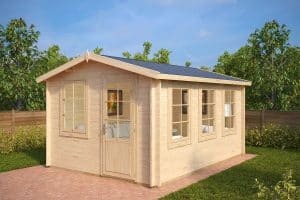 The Robin multifunctional garden log cabin has two equal size (12m2) rooms and a very generous 4x3m (10” x 13”) veranda. The rear room is often used as a storage room and workshop shed. The other room together with large veranda make a perfect place to relax or host parties in your garden. The two areas are well connected with our premium sliding doors. Sometimes just four walls, a flat roof and a sliding door can achieve surprisingly good results! 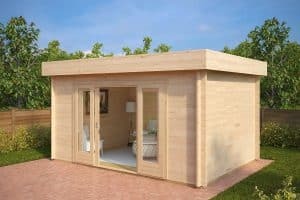 With these so called simple things, the Jacob E is one of our clients favourite garden rooms and thanks to its simple construction it is easy to offer special sizes on request for very affordable prices. Jacob E is widely sold in 4x4m and 4x2m versions. Over the 2015 season we noticed a growing demand towards summer houses with large verandas. So we introduced 25 new cabins with verandas for 2016 season. The Eva E with veranda is just one of our 40 garden buildings with a terrace or veranda.